Standards Australia guidelines may ban installations of battery storage in homes or garages, despite industry backlash against draft proposals. Fresh concerns have emerged over the introduction of potentially industry-crippling battery installation safety guidelines, after the release of a draft report from Standards Australia appears to have upheld a controversial recommendation that effectively ban battery storage systems inside homes and garages. Clean Energy Council CEO Kane Thornton says the industry had hoped that the controversial guidelines would be scrapped after the similar recommendation from Queensland regulators, which also surfaced in February, was revised out of that state’s guidelines following consultation with industry. And he said that a previous disclaimer from Standards Australia, that state governments did not have to adopt the recommendations, was not good enough. “There do need to be strong standards across the industries, and therefore as this progresses, whatever standard is reached will be applied to the industry. …therefore we’re very engaged and concerned,” Thornton told RenewEconomy on Wednesday. Industry players will also be hoping for some common sense, having already condemned the proposed SA guidelines as “ridiculous” and over the top, particularly in comparison with international standards. They have also warned that the requirement for batteries to be housed in independent structures risked adding thousands of dollars to the cost of battery installation in Australia, making it uneconomic for the millions of solar households in Australia keen to store and batter manage their PV generation. “If you’re going to ban the installation of all battery storage in the home, you might as well ban all laptops,” said Richard Turner, the CEO of Adelaide based Zen Energy, which partners with one of the industry’s pioneering battery storage makers, Greensmith. For the CEC’s part, the industry body has pledged to mount a strong campaign to have the standards removed or revised. “Heavy-handed regulation of home energy storage devices risks crippling one of the most exciting industries of the future before it gets going,” it said in a statement on Wednesday. “We believe that as long as home energy storage units meet strong international standards and are installed by an accredited installer to clear guidelines, requiring units to be installed outside of a house is unnecessarily restrictive,” it said. Finkel Review: What's in it for solar and storage customers like Jenny? Standards Australia is a private body now, can anyone tell me who owns them by any chance? That would be the whole point of this, wouldn’t it? Think about the politics. That means that one installation featured in the article, that if one looks closely, was improperly installed without necessary space around it to facilitate ventilation. Of course the bloody thing was always going to catch fire! If you wish to protest, just send it here. I was thinking “Boeing767” and “Hoverboard” here. Hoverboard because the design and construction is rubbish in the chinese clones, made worse by serial counterfeiting. Boeing767 because they should have known better. The most likely pathways to a fire in a domestic battery are via the inverter/charger and poor cell voltage management (hoverboard or 767, anybody?). The battery itself shouldn’t even get warm at the low discharge rates possible in a household system. So does this mean that we can’t park an electric car in our garage, or for that matter, a normal car with a battery. I would check the ascociations between Standards SA and the fossil fuel industry and the Coal-ition. Because the latest AU standard does not allow for batteries being put into garages, EVs with their intrinsic battery storage system cannot be put into garages either. Maybe, or the standards may only apply to bespoke battery installations rather than packaged, mass-market things like cars or laptops. There are probably limits to how much manure the public will swallow. Perhaps it’s time to call a spade a spade, and say that this is MEANT to hold back renewable energy, and ESPECIALLY to hold back the possibility of people choosing to go off-grid, and fight it out on that field, instead of going in with one arm tied behind your back. Another idea is to force detailed disclosure of the ostensible risks, so that batteries that can prove they are not subject to those specific risks can push their way into the market in volume. Both Lithium batteries designed for fire safety, and non-lithium batteries in development, could then provide the support for renewable energy in volume. Self-regulation whenever it suits this Government but regulation when, as in this case, it suits the likes of the fossil fuel industry. SA are looking for comments, which need to reach them by 15th August 2017. Quite likely the FF industry pushing this one. It has no basis in fact or common sense. Their desperate now! Standards in Australia are usually left to govt scientists to determine, this is very odd. Make a submission to bribes australia regarding the battery standards matter. Dont assume your voices dont count. Remind me: isn’t free-market democracy $1=one vote? Its time for an investigation into who works for Standards Au, and who are they aligned with, who funds them and what revolving doors are operating. Certainly got the stench of some kind of corruption and / or idiocy. The government is hell-bend on stopping Australians taking control of their own electricity. They want us to pay more because they have done dirty deals with the energy companies. Shame on you, you despicable government who cars for Big Business to the detriment of normal Australians…. Vote the scumbags out. The public has been sold out for decades… nobody really cared… this will continue until we have an uprising… at present it is not bad enough for this to happen. Like Peter Finch in Network: I am mad as hell and not going to take it anymore”…I have written AGAIN to my Federal Member….but we need everyone who is being subjected to higher and higher prices to stand their ground. We are not going to let these scumbag keep giving it us…. Robert are you as mad as hell about the disaster of a climate being left to younger generations, or that you may not be allowed to install some batteries in a house? Hi Shane – I am mad about the government direty deals with BIG Energy. Mad that we are going to leave a mess for our children. Mad because the government is legislating so we are forced to pay HIGH prices and continue to pollute the planet. Mad as hell that the politicians are behaving like spoilt children…. And what say do we have? The opportunity to vote every 3 years for frauds and liars campaigning in a faulty system (Roberts, 77 votes). This is getting us nowhere. Waste of time Robert. It’s not that some are worse than others; it’s that no party will admit what climate science is screaming. The public is indifferent to this so on goes this zombie like capitalism led by conservative politics. Everyone has it too good, allowing them to ignore the unpalatable and be accepting of the conservative politics that makes up our entire political spectrum. The smoking gun here is proof that Standards Australia have been leant on, or are acting under instructions of government. If such proof exists, let’s hear it – we’ll crucify the bastards through social media. Max I give that 9/10 for tidiness. That leftmost conduit isn’t *quite* exactly vertical, so I’ve deducted 1 point. Err Giles, no doubt there will be a requirement to “retrofit” a cage around your battery…you need to be kept safe from yourself, yes. What about storing 40-50L of highly flammable, volatile hydrocarbon fuel in a garage? No worries! That could never create a problem. It smells like a coal rat has gotten into standards Australia… dirty tactics for desperate times. I think clause 4.5.3 regarding Lithium battery fire risk is the clause in question. It forbids batteries inside or in ceilings or under the floor of domestic dwellings (or within 1m of an egress or the neighbours). 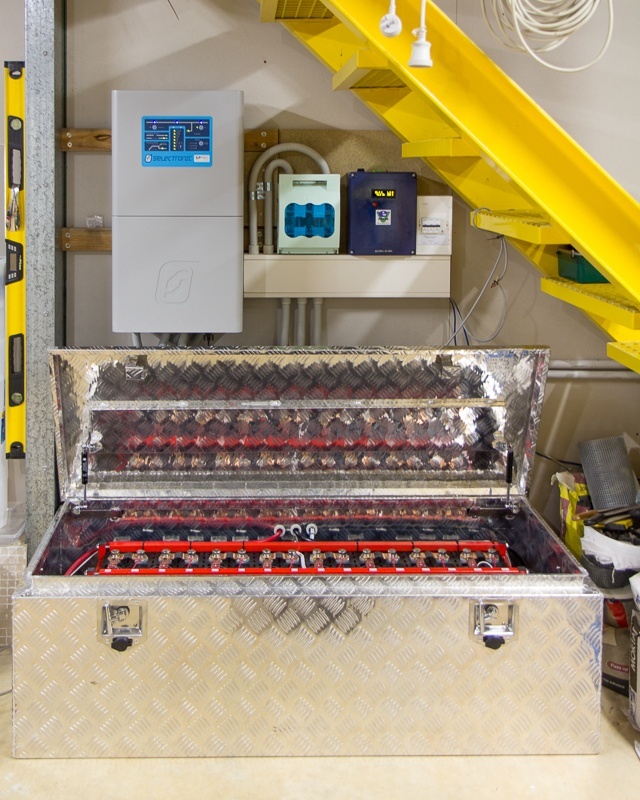 Batteries may be mounted outside if enclosed within a 60 minute (60/60/60 FRL) fire rated enclosure or if a barrier, good for 60 minutes flame exposure, is installed to 2m above and 600mm in other directions from the battery. I think similar regs apply to gas bottles. If your battery goes feral then you will be glad of that 60 minute enclosure. What about solid state lithium batteries that Mr Dyson is developing? I mean SSL is much harder to ignite and is much safer. Lucky me, my house is made of asbestos! Grossly unacceptable and I would immediately install an installation in violation of this bogus clause. ASAP. Batteries are a very low fire risk. They’re all over your house already. Batteries aren’t gas bottles. Where else in the world are “cages” required for home battery installs. This nonsense can only happen in Australia, the arse end of the world when it comes RE and meaningful action against climate change. Any excuse to prolong COAL will do. I trust that those “Standards” dudes will now require “cages” to be installed around Laptops and Mobile phones…ha, ha, ha. More evidence of the economic reach of the fossil fools and how desperate and dirty they’re willing to be as they vainly try to fend off the impending end of the fossil fuel era. It won’t help them and it’s happening faster than they think. I think they have written the standard for worst case possible outcome. As in a totally non complaint type of battery management system with sloppy workmanship. Perhaps what is needed is compliance with best practice as in no battery system with non compliant management systems being able to be imported or in fact Australian made. Is this a total dismissal of the current compliance with Australian Standards or more likely the country as usual does not have any to comply with. Believe me this would not surprise because in the chemical industry the country is pathetic frankly. Hmmm… perhaps all battery systems will need to be factory-built, with integral safeties and anything else would need to go in the “bunker”. THAT would make a lot more sense…. and would prevent a lot of folks from cutting corners to get the cheapest system possible. It`s a wonder Frydenburger hasen`t latched onto this as a nail in renewable`s coffin …. He’s genuinely not smart enough. One of his advisors might let him in on it eventually. The NBN involves installing a battery inside the house. So are they going to ban the NBN batteries? God yes, anything to stop Turnbull’s Copper Crapper NBN. If its not 100% fibre…its not on ! The proposed standard is proscriptive (there are hundreds of ‘shall’s in it) and dwells on the negative aspects of batteries, and looks to have been written from an industrial perspective. More approprate to a switch yard than a garage. It also fails to differentiate types of flow battery or Lithium Ion cell. For example, LiFePO4 is extremely difficult to either set on fire or cause to vent, making it safer than PbSO4 in many applications. It would make a lot more sense to approach this form a device safety point of view. The purpose of the standard should be that of preventing harm, not pouring concrete. This sort of restirictive nonsense is likely to render Suatralia unfit for the century. By effectively banning residential batteries, it will limit the potential to install rooftop solar, which will limit the nation’s capacity to meet it’s present and future greenhouse gas targets. a lot of people have a UPS in their home, including me.. not yet with Li, but the time will come. Who the F**** are these ppl, coal stooges like the LNP? Okay, so I’ll buy an EV & connect it my inverter. Is Standards Australia going to ban new automotive technology as well? If so, then Australia will become a very strange, antiquated, little country. This is absolutely necessary and a good thing. I have done same with my Wet Cells for an off grid setup. Used a vented / bunded fire resistant (steel) external enclosure separated from the main dwelling . Tesla also acknowledge this (slight) risk and their powerwall is often mounted externally. In NSW (Australia) we have Bushfire attack levels ( B.A.L) legislation where even modest EXTERNAL fire risks are virtually eliminated. You can NOT get a house approved without a BASIX / B.A.L statement performed online and submitted at the development stage . The risk of an INTERNAL fire , although small , becomes significant when millions of systems are installed. And some are installed badly as has already been proven with Solar Panels having multiple faults and fires. Also it is only fair to reduce the fire risk to your neighbours houses in high density living to ensure ANY fire can not spread to their properties when yours goes up. The existing provisions for fire propagation and bushfire safety in the NCC (Vol2) and AS3959 are worthwhile considering. Both design standards treat habitable areas and non-habitable areas differently as far as the level of fire protection needed for each. For new builds, a worst case risk in the form of a lithium battery on a wall could be added to ensure shielding of habitable areas. I suspect AS boffins have overreached in their fear of rarely occurring lithium fires and would absolutely be going over the top by insisting on a separate enclosure. Different risks presented by different chemistries should also be held in consideration. I agree 100% it needs to be intelligently risk analysed. That’s why LPGas bottles should have the pressure relief valve facing OUTWARDS and be outdoors. This minimises the risk as there is a lot of energy in a 45KG bottle. Ditto EV”s technically they are secure as the batteries are thermally managed in a custom designed enclosure, so low risk. That is their problem right there. Actually, speaking as a firefighter, it is not such a bad idea. I have been considering installation issues for my own home and an external or remote location makes a lot of sense. Should my colleagues ever have cause to attend my premises I am aware that the speedy isolation or removal of risks posed to the primary search team might be crucial. So anybody not on a qtr acre block can miss out on storage, hey? How about petrol cars, gas bottles and oil heaters, not a problem presumably? Yes, of course they are a problem and that is why we identify such risks in a process known as a size up and attempt to negate or at least mitigate them BEFORE making entry. You are not specific about your particular circumstances but I guess the point of a discussion is to learn to see from someone else’s point of view. Perhaps you would be kind enough to explain your issues ? We don’t design homes based on planning to set them on fire. “Standards Australia” isn’t a regulatory agency, right? So if they go through with this corrupt attempt to ban batteries, the correct move is to get all local and state governments to explicity reject their “standard” with extreme prejudice. Better yet, to remove all official support for such a corrupt organization and blacklist its fake standards entirely. Following on from the London Towering Inferno we now have public concern in Australia that our own high rise buildings are potential infernos due to lax building standards. Where was Standards Australia on that ? Now Standards Australia are just so happy to come down hard on home battery storage which has never had a problem anywhere. All this whilst multiple laptops and mobile phones exist in most homes. Just gotta wonder what Standards Australia are on about….stymie RE ???? Do your research. Batteries contain a lot of energy and fires do happen – Li Batteries can go off with a bang. I’m currently working on the supply and installation of a relatively small 15KW single phase 240V UPS with 2 hours hold time for a professional regional communications centre. It has to be housed within a suitably built fire rated room. By the way, the person that was taking about the 767 – it was the 787 Dreamliner that has Li batteries. I personally plan to install a UPS in my own home and when I do, I will make sure that its housed in a suitably safe location. Each to their own. I’ll consider the engineering design and safety while others can go with the conspiracy theories. Personally, I want my home and family to be safe. A fridge just caused a tragic fire in UK. Standards Australia should set standards to ban fridges from homes and garages. Makes as much sense.